As I will tell most everyone, I’m not ‘up’ on a lot of celebrity gossip. While I am the first person in the room to point out a random appearance of a mildly obscure actor—be it Stephen Merchant or Faran Tahir—in whatever film we may be watching, I am the last person to find out when JLo and Marc Anthony have split up (though in that particular instance I was trying to figure out how Mark Anthony even knew JLo as he had died in 30 BC). I’ll scan an outdated People Magazine at the hair dresser’s or dentist office, but it takes a pretty special celebrity for me to openly gush. Please don’t ask anyone I went to high school with about me and Elijah Wood. That being said, it takes an especially special celebrity for me to want to read their autobiography. Simon Pegg is one such celebrity. So when I discovered, through a mild amount of Twitter stalking, that Simon Pegg had written an autobiography, I squealed and raced to work to pick up a copy. I was not disappointed. If ever there was a moment for making use of the [time machine], it was now. To have stepped from the device into my living room made up as Bub (the lead zombie from Day of the Dead) at the tender age of sixteen would have been so much fun. Well, at least for the future me. The younger me would have probably fainted or else ruined a perfectly good pair of skin-tight black jeans. But this is not just a book about Star Wars and zombies (although that wouldn’t have bothered me at all). Pegg, always shy to discuss more personal or familial details, takes time while recounting his adventures to turn to more personal stories, discussing his wife and daughter, the separation of his parents, and even failed relationships of his teenage years. Every instance is recounted with honesty and nostalgia, illustrating a fondness for even those people who have caused him pain. These tales are never self-serving or overly dramatic, but recounted as if he were speaking with friends. There is an objectivity to his writing and an understanding that everyone has grown up, as it were, that allows the humor of awkward situations to come to the forefront ahead of pity. Pegg recounts his life the same way he crafts his characters: with sincerity and reflection, the first to admit his mistakes and relate his good fortune. 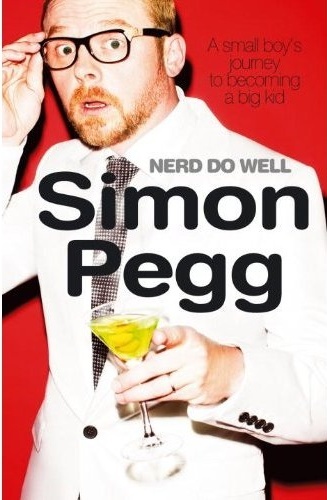 Nerd Do Well reads as both a fascinating narrative of Pegg’s life and an underdog story of sorts: who would have expected an odd, small-town kid to go on to refer to such personalities as Tom Cruise and JJ Abrams as friends? It’s an inspiring and delightful story from an up-and-coming actor, and I would encourage any fans of film and television to pick up a copy and discover the little-known story of ‘becoming a big kid’.